Another sports venue is hitting Washington, DC’s burgeoning landscape, as the Entertainment and Sports Arena will celebrate a big occasion this weekend. On September 22, the Entertainment and Sports Arena will have its ribbon-cutting ceremony. The 4,200-seat venue is part of a $65 million redevelopment of the former St. Elizabeths Hospital’s east campus that includes a training facility for the NBA’s Washington Wizards, along with office, residential, and retail space. 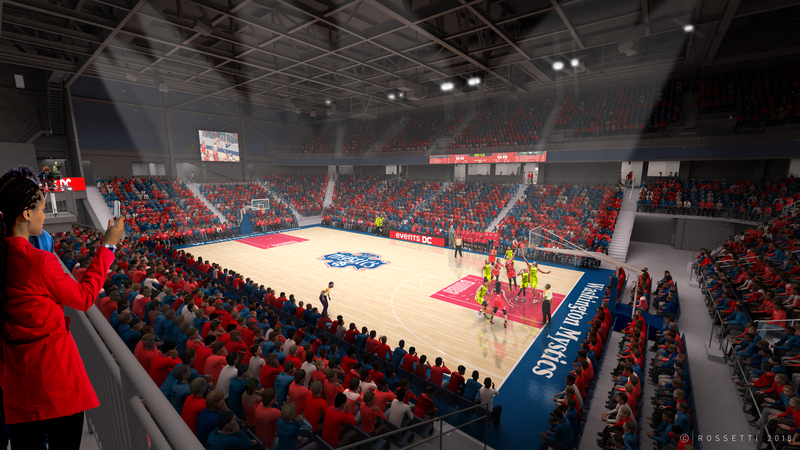 Both the Washington Mystics (WNBA) and Capital City Go-Go (NBA Gatorade League) will play home games at the arena, with the expansion Go-Go set to launch this fall. The project has been eagerly anticipated leading up to its opening, as it has a few distinct elements. For Monumental Sports and Entertainment (MSE)—owner of the Wizards, Mystics, Go-Go, NHL’s Capitals, and other franchises—the facility represents the opportunity to boost its basketball squads. The Wizards will receive a modern NBA training facility, while the Mystics and Go-Go get an arena that should be conducive to their respective leagues. Basketball is one part of the equation for the Entertainment and Sports Arena, which will host numerous other events, including esports and MMA. Concerts are also going to be a major factor in the venue’s slate, as evidenced by its current event schedule. A performance by Mary J. Blige on October 6 will mark the first major event at the Entertainment and Sports Arena, followed on October 13 by a concert from Cage the Elephant. Having an arena that is versatile in its offerings can be an advantage on many levels. Along with the ability to host multiple professional basketball teams, the facility seems likely to draw concerts that are too small for Capital One Arena. For Washington, the overall concept fits its broader professional sports facilities push. Going back to when Capital One Arena debuted in DC’s Chinatown neighborhood in 1997, Washington has seen several sports facilities open their doors over the past few decades. That includes Nationals Park—home to MLB’s Nationals, which debuted in 2008—and Audi Field, D.C. United’s new soccer-specific stadium that opened for MLS action in July. The city is also expected to make a push for a new Redskins stadium as the NFL franchise searches for an eventual replacement for FedEx Field, with the current site of RFK Stadium potentially being redeveloped to include a new venue. For those looking to see the arena in person for basketball, the Go-Go’s schedule provides some dates to watch in the near future. That includes November 3, when the team will host the Greensboro Swarm in its first regular-season game at the new arena.